These Digital Hygrometer Thermometers are made by P3 International. They come in the manufacturer's original packaging and carry the full manufacturer's warranty. This small compact device measures Temperature and Relative Humidity. In addition, it stores the max and min values over time. It is important to monitor the humidity levels of your home. Not only does excess humidity makes your home stuffy and uncomfortable, it can lead to health and mold problems. 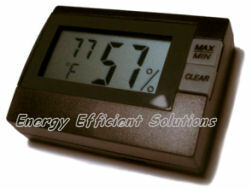 This mini hygrometer will display both the temperature and humidity. According to the ASHRAE comfort chart, acceptable humidity levels generally range from about 30% to 60%. Other reports indicate that molds and biological contaminates can become problematic as RH increases above 55%. Size: 2" x 1 1/2" x 5/8"